I hope you’re all enjoying this glorious weather we’re experiencing. 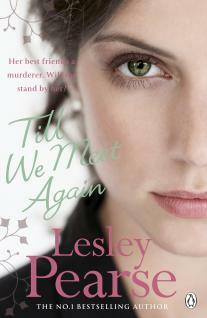 I was rummaging through my book box yesterday and came across ‘Till We Meet Again’ by Lesley Pearse. I yanked it out and read the blurb, thinking oh this looks good, and then I remembered I’ve actually already read it. So I thought I would do a little review on the novel as it was absolutely phenomenal and I really enjoyed it. I used to be glued to it when I was commuting to London every day. I don’t want to give too much away otherwise there will be no point in you reading it, but it’s about two best friends, who go their separate ways after school. One goes onto university to study law (Beth) and the other (Susan) stays at home to look after her sick mother. However, when Susan loses her own baby due to meningitis she walks into a doctor’s surgery and guns down two people. The long-lost friends come face-to-face again when Beth is forced to become Susan’s lawyer. Will Beth give her the time of day? Will Susan get off for her crime (or crimes….)? and the question I know you’re eager to ask is why did Susan kill in cold blood?! Things get even more complicated when Beth begins to fall for the detective in charge of Susan’s case. She then has to decide whether to stand by her man or protect her friend.